"I'm not going to spend the rest of my life dreaming about what I could have been, what I should have been. I deserve more and I'm going to get it." Deep Space Nine is evacuated yet again when a Smoke Monster plasma storm appears; a skeleton crew – and Quark – are all that are left to defend the station. They get more than they bargained for when the remaining team members rescue victims of the storm who take over the ship – and in the process we somehow get a sort of Dax-centered episode. 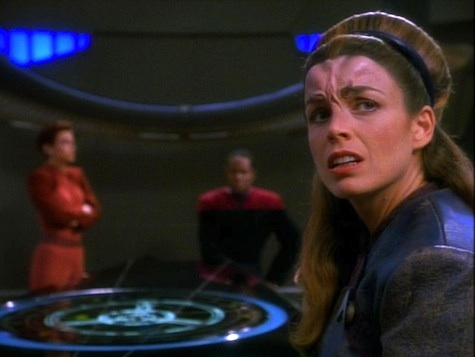 I've been looking for an episode about Jadzia Dax to appear since we began to explore the character last season in "Dax," so I was pleased to have this episode come up, especially since Dax had really a minimal role in the previous three episodes. I read the description for this show, and, based just on the whole "oh god we're going to evacuate the station yet again" premise, I was ready to hate it. But the minute the incoming Klingon/Trill terrorists held O'Brien hostage against Odo, forcing him to give up his shape and go into some kind of stasis jar, I knew we were in for some kind of ride. Turns out the terrorists don't want Deep Space Nine – they want Dax, the symbiont that carries the memories of Curzon Dax and is now partnered with Jadzia. Verad unfortunately is one of the 90% that never qualified to become one with a symbiont. His thirst to better himself has led him to believe terrorism and murder are his only path to reaching that level of perfection. With the assistance of Klingon terrorists and his able girlfriend, Mareel, he manipulates Quark into betraying DS9. Jadzia gives in after Verad proves his ruthlessness and attacks Miles O'Brien. What we wind up learning about as a result of this choice is a lot more about Dax. Dax has independent memories, but is at least an equal or subordinate to whatever new dominant personality emerges. Removing the symbiont puts the former host at risk for death – meaning, in this case, Jadzia. Even while Jadzia's alive, however, Verad shares her and Curzon's memories of Sisko and their friendship. Sisko intelligently manipulates these memories to build trust with Verad, surprising Kira I think in the process. He also continually lays bare the truth of the existence of the new personality to Mareel. Sisko has continually displayed this kind of uncanny ability to break into the heart of people and manipulate them. 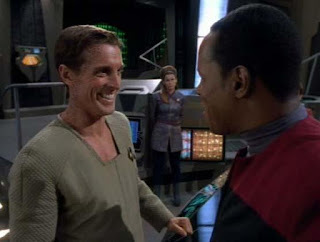 What's interesting is the depth of his newfound friendship with Jadzia, as well as his connection to Curzon, and how he has come to see them as separate yet unique beings. In the end I forgave the episode the whole evacuation retread (which is even more unbelievable when you realize the station was just evacuated one episode ago, also in a way that evacuated Rom and left Quark as a volunteer.) What I can't forgive is the lack of more information about Jadzia. Yes, we got Dax, but this was an opportunity to really show what made Jadzia, without Dax, shine. I think some of that self-sacrifice that impelled the Jadzia Dax combo to come forward should have been there. Instead we got "I'm scared, Julian, I feel so alone," and Julian being manly. I think this is a huge plot hole too: something made the difference between Verad and Jadzia. Something made Verad inappropriate, Jadzia appropriate. When will we ever see what this is? They keep telling us, but not showing us. Here, when the Trill is removed via pouch, Jadzia and Verad respond similarly, and I think that was a poor decision. While the incapacitating plasma storm seemed kinda hokey, it worked – and the images of the storm were convincing. You felt as if Deep Space Nine were suddenly transported to the end of some Maine islet in a hurricane. The stasis jar in which Odo was trapped. Again, I want to geekily raise the whole issue of Odo's mass. Shouldn't it be a much heavier jar? But then, Lwaxana Troi carried Odo's goo around in her apron last season. John Glover, who plays Verad Dax in this episode, later plays Lionel Luthor in Smallville. The Dax symbiont seen in this episode looked horribly, horribly, horribly fake. So was the weird kangaroo Snuggie Stomach Flap Symbiont Insertion Pouch (TM). In contrast, the acting around the scene of the surgery was sort of hyperrealistic, and looked even more fake. Almost more like a Nerf than a trill, isn't it? The Quark thing was never really resolved which annoys me. He was trying so eagerly! Quark: Chief, do you have any brothers? O'Brien: As a matter of fact, I have two. Quark: And did you ever have to say goodbye to them? O'Brien: Sure, when I joined Starfleet. Quark: And did it bring a tear to your eye? Quark: (nodding to Odo) Try explaining that to him. The show was enjoyable - but mostly because of the great acting. And while we found out more about the Dax symbiont, in some ways Jadzia Dax is still somewhat of an enigma. This and some logical issues with the plot - and that weirdly fake symbiont - make me give it a fairly low rating. It was entertaining for one watch, but I can't imagine it would be for two.